Monday. The beginning of another week. Good grief. We’ve passed the Summer Solstice (did you dance naked under the moon?) and the days are growing shorter. It will be August soon. Meditation apps are all the rage. I’ve sampled a few but haven’t found ‘the one’ that works for me yet. We breathe without thinking, but we can think more when we breathe. Inhale for the count of three. Hold for a count of four. Exhale for a count of five. This is my August objective. 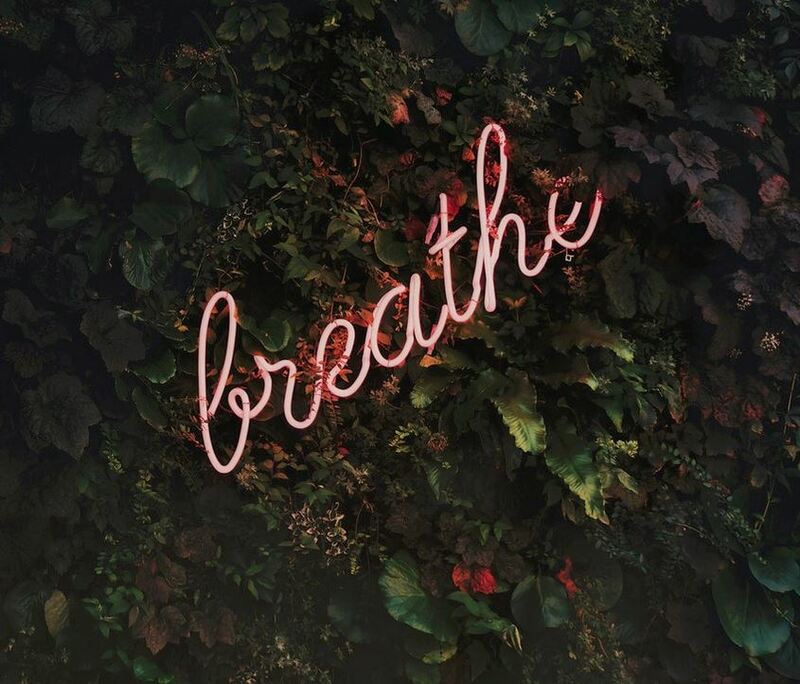 Breathe more mindfully. Also, for inspiration – “I am solid as a mountain” – oh, yes. No joke. 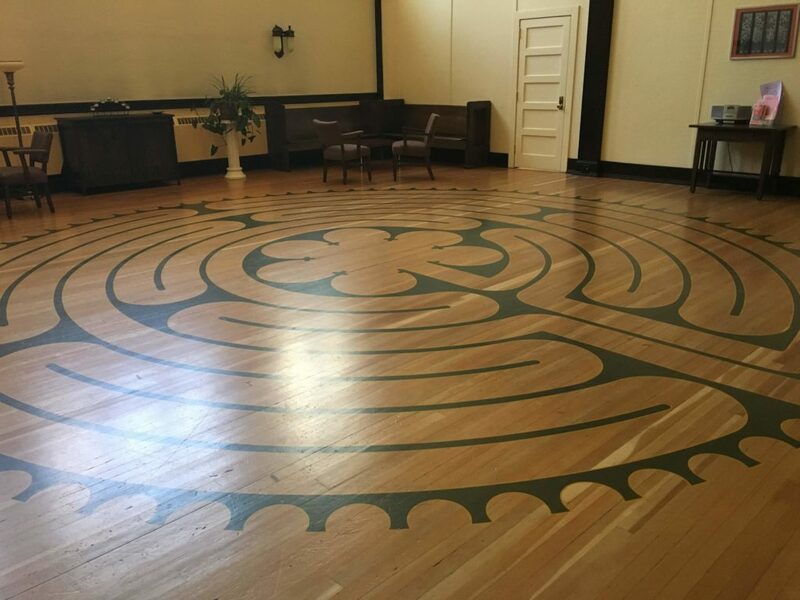 Last week, I joined my friend Diana Cranstoun for a walking meditation at a lovely indoor labyrinth in Calgary. Knox United Church is located close to City Hall, in the heart of busy downtown. But once the heavy doors to the street whispered closed, it was as if we were in another place – the serenity and peaceful hush crept up on us. She suggested something I’d never done in an outside labyrinth – we took off our shoes and walked barefoot. Completely in touch – grounded, if you will – with the cool painted hardwood floor. It was an amazingly restful period of silent contemplation, as we stopped at each curve for a moment to reflect, cast our intentions and wishes and express gratitude. Thanks for the inspiration and shared meditation, D! My mind is so active when I’m creating, I get easily distracted if I listen to music. Inevitably, the lyrics remind of of places or events from the past. That gets my thinking and before you know it, I’ve lost track of what I’m supposed to be doing because I’m meandering down memory lane. Usually, I work with only the hum of my laptop fan in the background. But from time to time, I also try soothing sounds like these Tibetan bowls. The resonant sounds and high pitch are supposed to have healing properties. I don’t know about that, but the gentle monotony isn’t intrusive. Many of the recordings have water flowing in the background. I don’t know about you, but hearing running water makes me want to hang out in the bathroom rather than concentrate on writing. I’ll admit, depending on my mood or the sensitivity of my eardrums, the high-pitch sometimes annoys me. And yes, it does get boring after a while. Then there’s the hairy hand – I find it a bit disconcerting, but if I play the video in the background, I don’t have to see it! I’m curious to discover what impact weed might have on my thought processes! I’ve been sewing like a machine this summer, partly because trying on garments in front of those three-way fun-house mirrors in store dressing rooms makes me want to weep or scream, but mainly because I wanted new stuff. I used to be able to always find something I liked at Winners, but for the last few years, the quality has cratered and the selections are boring – grey, black, dull blue and in patterns that no one I know would ever wear. It struck me as I was doing the seasonal clothing switch in the spare room closet that I’ve always had a huge stash of fabrics bought (and folded into plastic bins) over the years. Eureka – why not make those up? In university, if I was going to a party on Saturday, I was usually whipping up a new frock on Thursday or Friday. I often smile when I think of the little old lady who taught our class in 4-H Club how to stitch aprons and dish towels. My mother sewed our clothes. When we were starting out and poor, I sewed all of my children’s clothing. I’ve taken pattern drafting recently ( the amazing instructor Maria says, ‘clothes have to fit the body, not the body fit the clothes’). So I know what I’m doing. Now I have a dozen dresses that fit my unique body, shorts and shirts in colours and patterns I love. And it’s terrific. Now I can shop from my own closet. It helps that my good friend, Sandra, is also a sewist. Marie Kondo, the Queen of Tidying Up, suggests that we cruise our possessions regularly to discard those we don’t like or that don’t make us feel happy. I’ve been doing that bit by bit, donating to charities that help women get back into the workforce. But it’s hard to throw some items away because they still have some sort of emotional resonance or memory pull. It’s been 20 years since my mother passed away, and I have finally gotten rid of almost all of the things I’ll never use – embroidered handkerchiefs, lace gloves, cards of safety pins and bias binding in colours I’ll never use. She also has a neat way to fold clothes. I find it interesting that people get a sense of comfort from enumerating things – having them clustered for easy reference. We have the 10 Commandments, the 7 wonders of the world, the 7 deadly sins, the 3 little pigs, 50 ways to leave your lover. When I think of a concept like “the enemy”, I can’t confine it to one thing or a single person, but must join the wise ones and make a list. Apprehension clouds the brain, paralyzes the limbs and prevents me from ‘doing’. No flight or flight for me, but rather a gut-dissolving acid-bath of indecision. This is not to be confused with fear, which is what I would call a clean emotion, a purely autonomic response to danger. You know, when your heart lurches into high gear and your mouth fills with imaginary sand and the rush of adrenaline makes your brain crackle and your muscles strong. No, I’m talking about that draggy feeling of dread that makes you twitch like a trapped rodent, churns your bowels, cramps your stomach and sends you scurrying to the toilet bowl, hunched over with the heaves. Apprehension is that voice in the middle of the back of your head, that whines and carps until you want to scream or weep to shut it up. And afterwards, when the inconsequential event has spun out like an untied balloon and you are limp with unrealized dread, pathetic in your relief that nothing really bad happened, then you wallow in the sour dregs of self-disgust and vow never to be such a spineless powerless wimp again. Apprehension is the enemy of peace of mind. Cowardice is playing safe, never taking any risks, even good ones which would save your mind, your psyche or your soul or all three. This goes hand in hand with apprehension – a symbiotic relationship of parasites that cause you to play an endless mental game of “what if, what if” and when you can’t divine the answers with cards or horoscopes or tea leaves or intuition, you dither and never walk to the edge of the cliff to stare down at the froth of crashing surf. 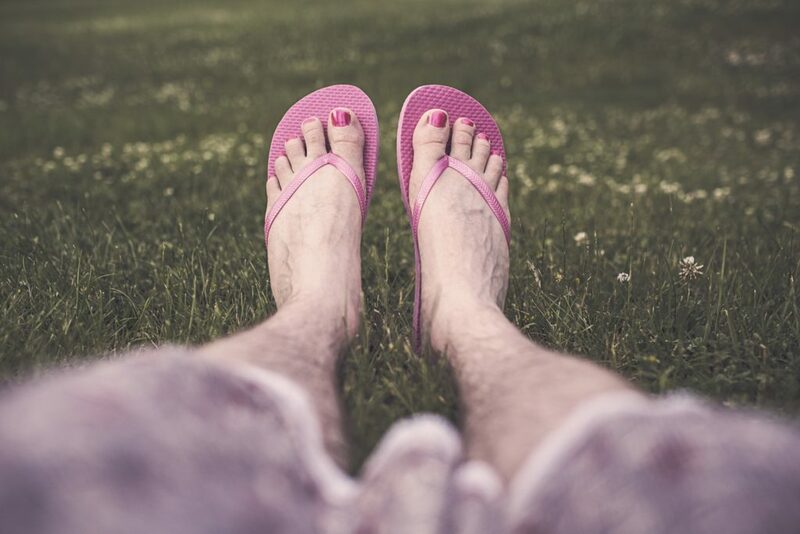 You never let yourself roll down a grassy hill under a sun-drenched summer sky, just because it is there, because someone might think you silly. You cover your mouth and never laugh out loud or taste something or someone new. You never speak to strangers on the bus or go outside without an umbrella on a cloudy day. What happens is, you stop living, because living, starting with the simple act of drawing in a deep breath and getting out of bed in the morning, is about taking risks. If you never take risks, you won’t ever know that you can make good decisions or that you should be grateful to our Creator for creating the cliff you did not fall off of. Cowardice is the enemy of resolve. Guilt and regrets are wasted energy. They muddy up your karma and take up valuable headspace that could better be used for daydreaming or reflecting on happy memories. That is not to say that you shouldn’t be remorseful when you’ve hurt someone or done something abysmally stupid. The trick is not just to lament what happened and feel sorry; the critical thing is to act. Say you’re sorry; make amends; pay for the damage. Then get on with life! Fenders crumple, feelings are hurt; neither is forever. We’ve all done things that make us wince when we remember them. But did the earth tilt and move out of orbit at the time? Can you keep it secret? If you can fix it; fit it. Then go do something worthwhile. Guilt is the opiate of weakness and the enemy of strength. “If wishes were horses, all poor men would ride.” Poor women too. Wishing, daydreaming about the perfect world or the ideal man or that dream house is escapism that just takes up action time. So who doesn’t want to win the lottery or find a cure for a loved one or help bring about world peace? But if I don’t buy a ticket, if I don’t give to charity or volunteer my services, what good am I? What kind of difference can I make if I don’t step outside, raise my face to the sun and pledge to do something to make a difference in the world? Making wishes is as helpful as making a prude stand naked in the mall at noon. And wishing should not be confused with fantasy, which is entertainment grounded in creativity, play and flexing the brain-muscle for pleasure. Wishing is the enemy of reality. Anger, like lye, corrodes, painfully, slowly. It rots the soul, the mind, relationships. Both parties in an anger relationship suffer, sometimes interminably, when the cause can no longer be discerned and the outcome becomes the event. Anger is like a stubbed toe – flaring hot, throbbing, immediately hurtful. There is little to be done to cool it and, by the time it has subsided, another quantum of pain has raised the level of your emotional reservoir. If the anger is a constant, it slops over whatever psychic retaining walls you construct and oozes into the unprotected crevices of your soul, a viscous eroding lava. Unlike the phosphorescent slash of a sharp retort easily shrugged off, unrelenting rage burns deep. 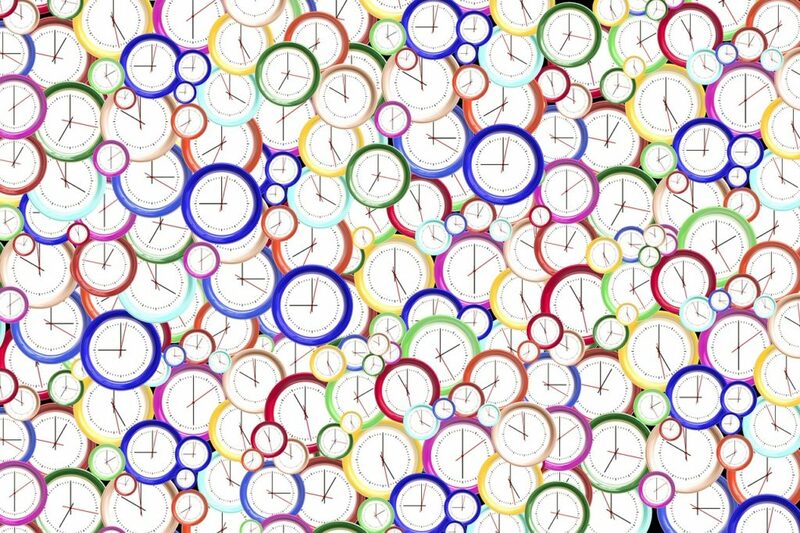 Counting to ten and being stoic are fine if you are dealing with a surly clerk in the department store, but in some situations, you could count to ten thousand and nothing would change. Anger is the enemy of peace. The most insidious enemy is, to me, lack of passion. Not sexual lust unbounded, unchecked, but more of a zest for life and all that encompasses. Curiosity about what makes things work and people behave as they do, joy at a sunset or a patch of random wildflowers, wonder at a star-flecked sky or the turn of a baby’s cheek, satisfaction of time well spent with lovers and friends, the warmth of a hug of a shared smile. Being passionate means being committed – to people, places, memories, events, causes – it is a doing, a grand collection of actions flamboyant and mundane, but all recognized as important. It is paying attention to your breath from time to time or the hum of blood under your palm when you rest your ear against it or the colour of the inside of a tulip. Passion is energy, focused and true. Whether you are pushing 40, 50, 60, 70 (or maybe even just pushing your luck), you’ll probably be able to relate. In mid-life your memory starts to go. You run up the stairs and jolt to a stop thinking, What did I come up here for? But you can remember in vivid detail that drive-in movie you were watching when your first boyfriend with his dad’s borrowed car slipped his trembling fingers under your sweater. In fact the only thing we can retain easily is water. Mid-life means that you become more reflective. You start pondering the ‘big’ questions. What is life? Why am I here? 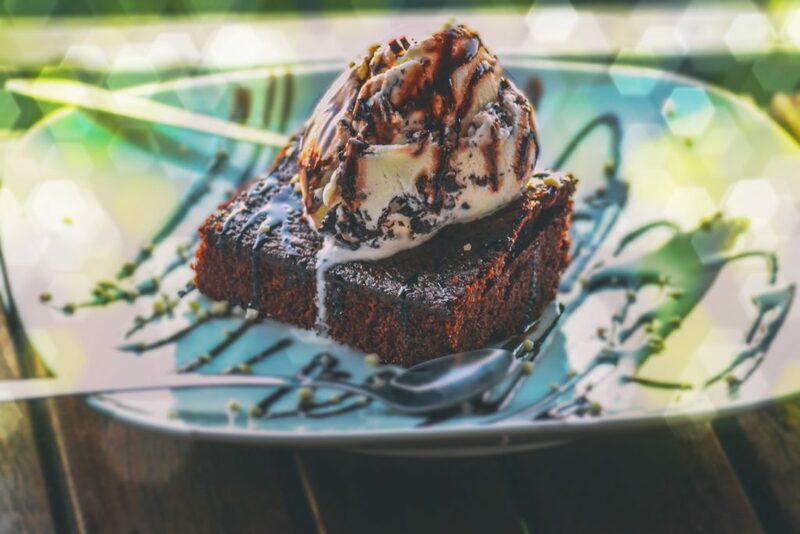 How much low-fat ice cream can I eat with a sugar-free brownie before it’s no longer a healthy choice? But mid-life also brings with it an appreciation for what is important. We realize that breasts sag, hips expand, and chins double, but our loved ones make the journey worthwhile. Would any of you trade the knowledge that you have now, for the body you had way back when? Maybe our bodies simply have to expand to hold all the wisdom and love we’ve acquired. That’s my philosophy and I’m sticking to it! 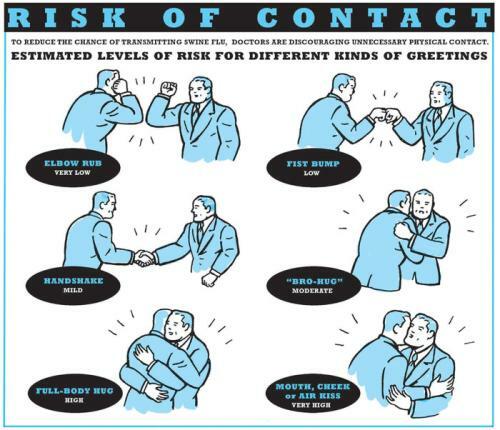 Remember the advice not to shake hands but to ‘fist bump’. Why? 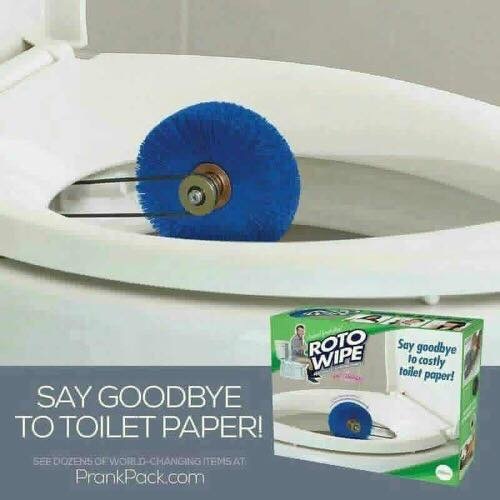 To prevent the spread of germs. I’ll bet you read that, laughed and then went euuuuw. Being the visual person that I am, I did a Google search for ‘fist bump’ images and among the zillions of images was this one. I found it odd that the two people are both men. And the hugs – even the ‘bro hug’ – seem really awkward. Maybe it’s the 50s Clark Kent look? Like the surfaces we touch and the ground we walk on, our bodies are teeming with thousands of different species of bacteria, from the Lactobacillus acidophilus lining our digestive tract to the Propionibacterium acnes populating the skin on our faces and arms. On average, about three pounds of our body weight is accounted for by bacteria alone. And I chuckled at the section on public toilets. I vaguely remember being scared witless by some old dame who warned that girls could get pregnant from toilet seats or from rogue sperm in swimming pools. Probably someone’s idea of a joke. 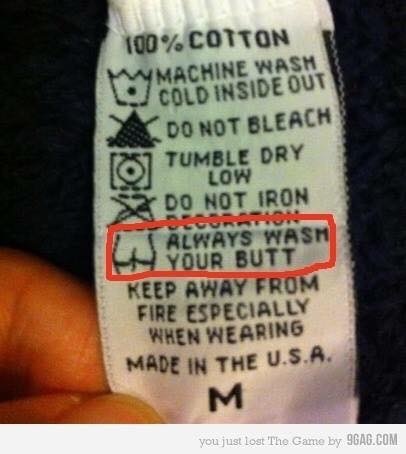 Don’t you wonder what kind of garment this label was in? I grew up on a farm with no running water inside the house, except for a hand pump in the basement. 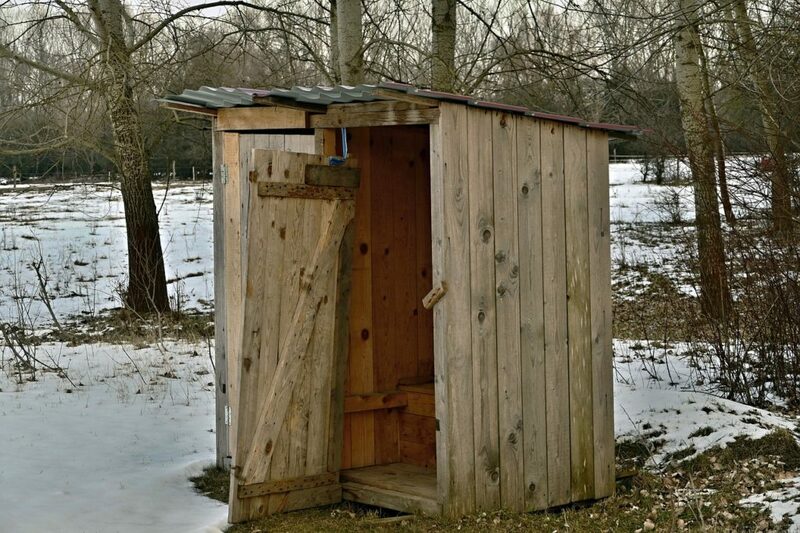 The ‘bathroom’ was a wooden biffy a few meters from the back porch. Nothing glamourous about that, but if one was inclined to linger (hornets in summer and icicles in winter) , there were old Eatons and Sears catalogs to peruse. Why the heck were those called ‘the good old days’?